The villa is a real haven of peace and tranquility with the only background noise being the sound of the sea! It is ideal for a romantic getaway, families with children or friends sharing. The villa has everything anyone could need on holiday. The location could not be better, you can stroll along the beach to the world renowned Puerto Banus in 12 minutes and Marbella in 20 minutes. El Corte Ingles Supermarket and Department Store is only a 12 min walk from the Villa, where you can sample a stunning array of culinary delights and admire many designer boutiques. The villa is south-facing with large French windows so it is light filled all day and is the only villa in the complex with direct view of the magnificent pool. You can have breakfast in the rising sun and watch the glistening Mediterranean from the lush tropical garden. The south facing terrace is ideal for ‘al fresco dining’ with an awning that can be used by those who prefer to dine in the shade. There are numerous places of historical interest nearby. The Moorish City of Granada with its Alhambra Palaces and gardens, one of the most brilliant jewels of universal architecture is approximately 1.5 hours drive. Europe’s sunniest ski resort, the Sol y Nieve in Sierra Nevada, host of the 1996 World Ski Championships is located 45 minutes drive from Granada city. The Costa del Sol is at the forefront of Europe for sailing with its excellent marinas and invaluable berthing capacities, these include marinas at Marbella, Puerto Banus, Estepona, Duguesa, etc. Golf details: The concentration of quality courses, the unique sunny and warm winter climate, and the hospitality of the local people make the area absolutely ideal for golf lovers. When Valderrama was chosen to host the Ryder Cup in 1997, the Costa del Sol received worldwide recognition as being the best 'Winter Golf Resort in Europe'. The final honour was the selection of Valderrama to host the 'World Championship' in November 1999. The general infrastructure in the region has improved. The completion of the new highway has greatly reduced the travel time from Malaga to Gibraltar. There are more than 55 golf courses in Andalucia and 30 of these are on the Costa del Sol. The villa is surrounded by golf courses. Each offering its own kind of challenges on excellent fairways and perfect greens. The single bedroom has bunk beds. Location, location, location this luxury villa is only a few steps from a secluded beach with golden sand and turquoise sea on Marbella’s aptly named Golden Mile. It is situated in the exclusive Oasis Club, a beautiful complex with tropical gardens and flower filled paths leading directly to the beach. 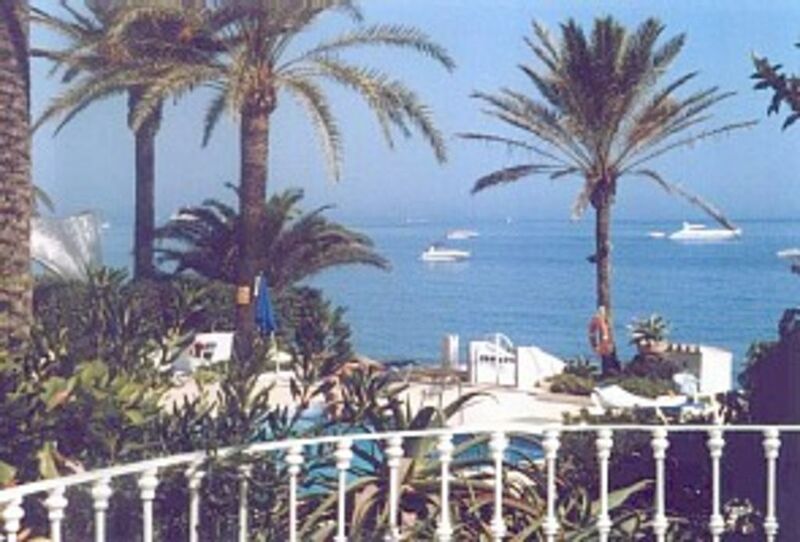 The pool overlooks the ocean and you can step directly down onto one of Marbella’s most beautiful beaches. Puerto Banus is a 12 minute walk and Marbella is a 20 minute walk from the villa.